San Francisco in 1857, from Nob Hill. Yesterday afternoon, our bold barber planned an elopement to take place in the evening; and the lady, nothing loth to reward his enterprise, entered into the plot, keeping the whole affair a sacred secret from her family, and particularly her watchful brothers. The Count accordingly, with her connivance, made his arrangements; a cab was engaged and posted on Bartlett alley, a short distance from the Marseillaise Saloon; and the driver was well paid to await the progress of affairs. At the same time, away up on Broadway, near Dupont street, the proper arrangements had also been made, and Justice Bailey, of the Second District, was in waiting to tie the silken strings of matrimony, any moment the lovers might chance to appear. Everything being thus ready, about 8 o’clock last evening, Count de Shears and several of his friends approached the Marseillaise Saloon. The friends went to the bar and engaged the attention of the bar-keeper, while the beautiful Therese stole out to the Count, who, by appointment, was standing outside the door. While the friends amused the bar-keeper and the brothers, the lovers slipped around into that romantic thoroughfare, called Bartlett alley, entered the cab and drove off in a circuitous direction for the Court of Judge Bailey. Hardly, however, had they commenced rattling over the street, before the alarm was given and the inmates of the Marseillaise Saloon started forth in pursuit. A cab happened to pass the corner of Kearny and Dupont streets in the very nick of time in which they sallied forth, and supposing that it contained the fugitives, they pursued with all their speed. By the time they overtook the vehicle, however, the happy couple, who had taken an altogether different direction, had appeared before the Justice, sworn eternally to love each other, and been bound in those ties which none but Heaven ought to dissolve. They retired immediately to lodgings, prepared by the foresight of the happy husband, and no tongue can tell how happy they were. The brothers of the bride during the night scoured the whole city in search of their lost sister. 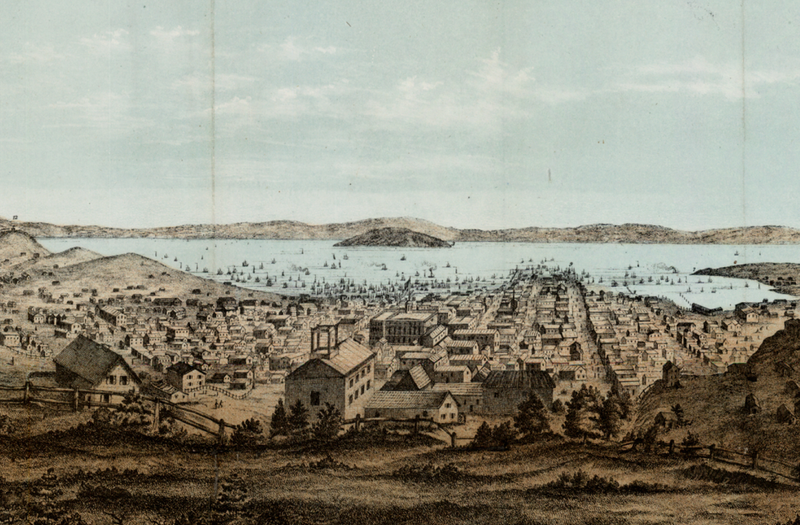 They went through every street, went to the Mission, searched and inquired in every quarter, but without success, until this morning, by means of a largess paid the cabman, they found out the retreat of the lovers on Sacramento street. They forthwith proceeded to the spot, and the smiling sky of love was for a brief period o’erspread with a storm of passionate remonstrances, poured forth upon the head of the beautiful lady and her brave lover by the unfortunate brothers; but Hymen [the Greek god of marriage], who had joined, protected the devoted ones, and the brothers at last departed, satisfied that there was no use of weeping over what was irretrievably lost.